Maybe it was Willy Wonka and the Chocolate Factory or maybe it was our deep love of chocolate. However, when we learned about Long Grove Confectionery's factory tours, we knew that we had to go. Plus, the factory is in nearby Buffalo Grove and the tour only costs $2 per person--a perfect adventure for Kat, me and the girls. The factory is easy to find and is located in an industrial section of Buffalo Grove. To go on a tour, you do need to call ahead and reserve a spot. They do tend to fill up on days when kids are out of school. (A little word of caution.) So, if you are thinking about a little adventure on a day off, advanced planning will help. Since tours are only conducted certain days of the week, you cannot just show up and go on one. When planning, be sure to ask if there will be live production. When we went, there was no live production. However, the tour was still very worthwhile. Mel's take: I have been to the Long Grove Confectionery store in Long Grove while they dipped strawberries. Much enamored with chocolate, Mini Mel watched them for quite some time. So, I thought that she would love to venture to the actual factory and learn more about chocolate production. The tour was absolutely perfect for her (and me as well). 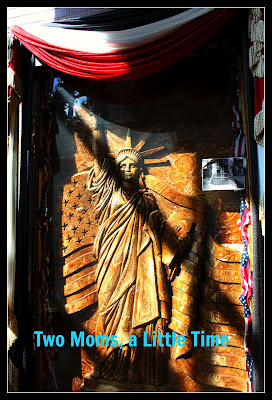 When you enter into the lobby, you are greeted by a large chocolate Statue of Liberty. This is one of the few places that you can take photos. (Unfortunately, mine did not come out very well.) The girls were immediately excited about their adventure. I guess chocolate has that effect on people! The tour begins with a brief movie about the history of Long Grove Confectionery. The movie actually sheds some light on the history of Long Grove as well. Amazingly, the kids were pretty captivated by the film. In the same room, the Confectionery displays a large chocolate Santa. We learned that the Santa was put in a case after a child nibbled on it. Now, I love chocolate, but who knows how old this Santa is? The girls giggled about this little anecdote. The tour was very nicely done. The guide was extremely knowledgeable and was great with the kids--not only with answering their questions but keeping them in line! 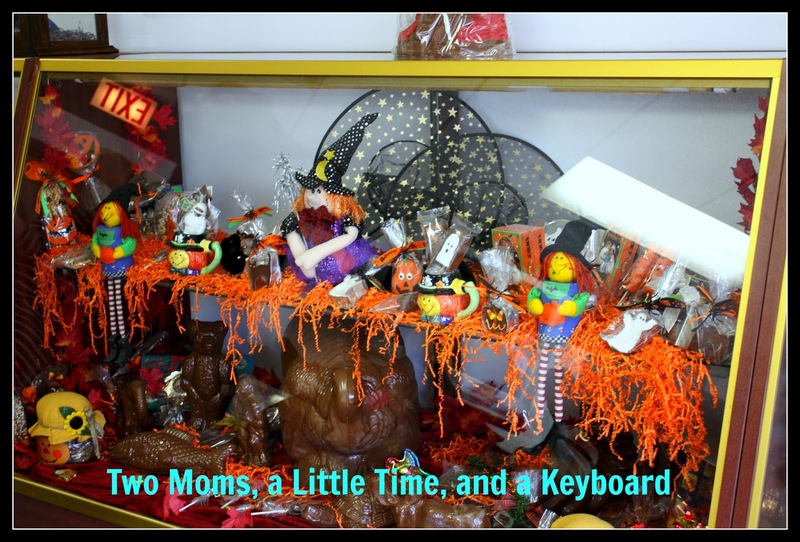 You could also see her pride in the work being done at Long Grove Confectionery. She was a wonderful guide! Some tours do not give you a decent peek into production. At Long Grove, there are large windows for viewing the factory. So, when there is live production, the fun will be easy to see. Additionally, short videos enhance the tour at each stop. At the end of the tour, everyone is treated to a piece of chocolate. A nice sweet ending! Then, you exit through the factory store. 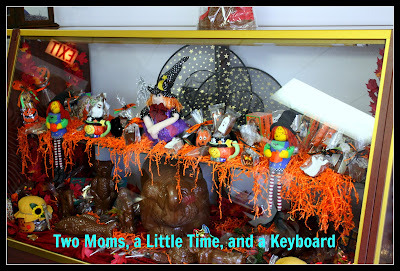 The factory store has an amazing array of treats--truly more than I expected. At the great prices, you cannot resist bringing something home. After visiting, I am kicking myself for not going sooner. Of course, my waistline is probably happy! You can visit the Factory Store outside of the tour. Kat's take: As a spring break diversion, we came here to take a tour of LGC's chocolate-making factory. Set in an industrial area in Buffalo Grove, the factory was on hiatus during our visit (their Easter production was finished long ago, the tour guide explained). Nonetheless, it was interesting to take the short tour (maybe 30 minutes, including an introductory video). We could see the extensive machinery used to manufacture all the chocolate goodies (LGC uses chocolate piped in from Blommer's). Some of the highlights are the 500 lb. 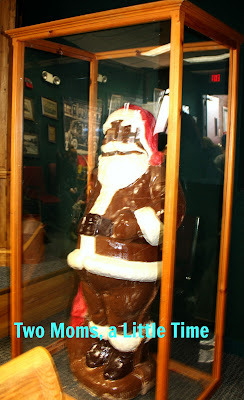 chocolate Santa, which is now enclosed in glass (after an intrepid little girl took a bite out of him years ago! ), and chocolate reproductions of paintings by Monet and Seurat. The tour ends in the factory outlet store, where you can get sweet treats at a discount. This was my daughter's favorite part! For $2.00/person, the tour was worthwhile...everyone gets a free sample of chocolate. We stayed for less than 2 hours, which made it a short activity. But I'd happily return; we can never have enough chocolate! The Long Grove Confectionery Factory and store is located at 333 Lexington Dr. in Buffalo Grove, IL. To sign up for a tour, call 888-459-3100. 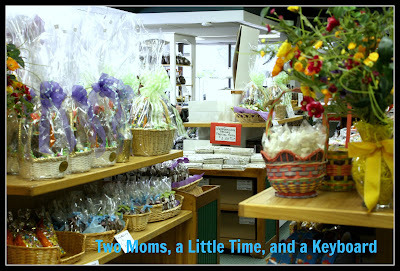 You can also visit the Long Grove Confectionery Store at 220 Robert Parker Coffin Rd. in Long Grove for more treats! What a fun tour! Love that you can see how everything is made and understand the process. Love the story of the chocolate Santa. Thank you for coming to link up to Travel Tuesday!